One prong set oval cabochon cut natural turquoise, measuring 17.90 x 13.70 x 8.37mm, approximate weight of 11.13ct., clarity is heavily included, medium, very slightly grayish, greenish blue color, (GIA gB 5/3), cut is good. Transmitting light very diffusely, opaque. Graded in the setting. Turquoise is commonly impregnated to improve the color and texture. Evidence that may confirm this is typically lacking. Reminiscent of the Turquoise from the Sleeping Beauty Mine in Arizona. 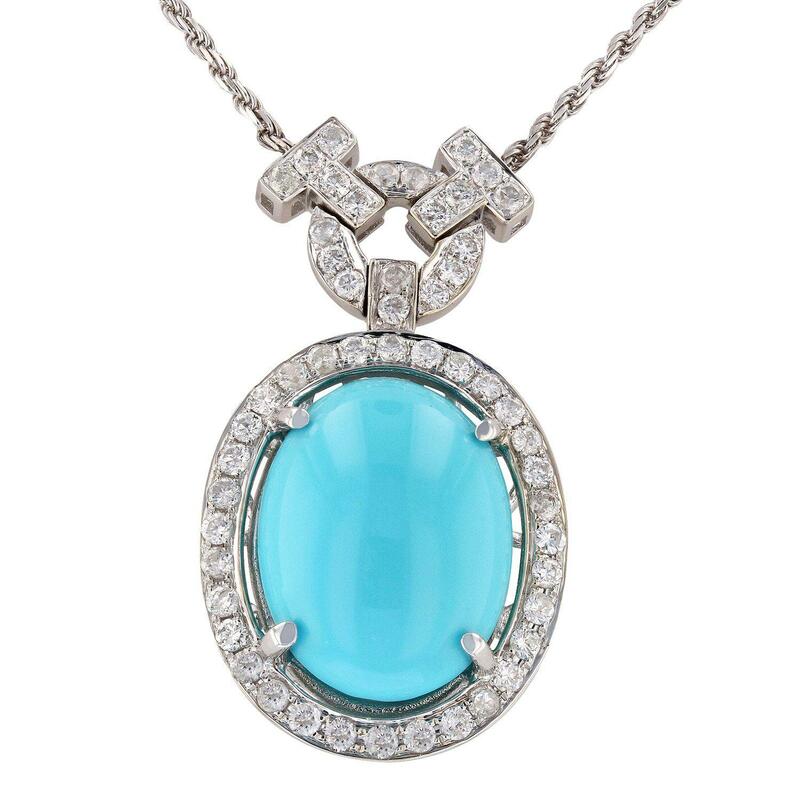 Sleeping Beauty Turquoise was first discovered by the Native Americans in the very distant past. The baby blue or "Robin's Egg" Blue Turquoise was mainly used as bead and shell jewelry. Fifty-two bead set round brilliant cut diamonds, measuring 1.80 - 1.80 x 1.08mm (depth est.) approximate total weight of 52 Stones = 1.17ct. Graded in the setting. Total Weight of Colored Stones 11.13ct. Total Weight of Diamonds 1.17ct.